Programmes and training offered at Skills Johor focusing on 6 industries, aligned to the economic thrusts of Johor. 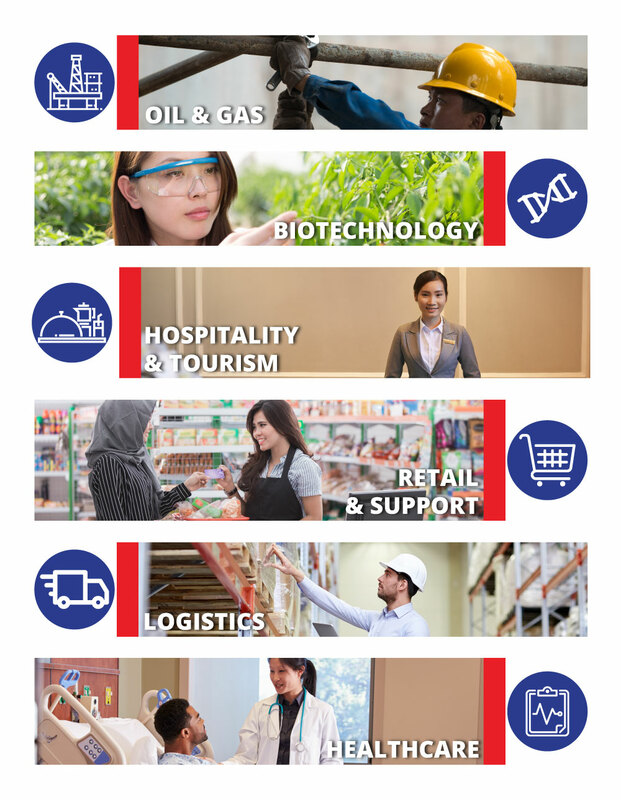 Skills Johor is here to help the industries to fulfil their training needs and specialises in a wide-range of training resources from hands on training sessions to user guides and online tutorials. Internationally recognised training programmes are designed based on the requirements from each industries. The hub is being built in the state that is experiencing rapid development within the country and in the region, thereby creating a critical skills gap of more than 100,000 people particularly in the oil & gas industry in RAPID Pengerang and integrated tourism attractions at Desaru Coast, as well as other industrial growth areas. One of the key factors for a thriving skills training hub is the collaborative network between Skills Johor, training providers and the industries. Also, an established ecosystem is vital to ensure the success and sustainability of the industries. Industries will be our active partners in providing advice and information on requirements, curriculum design, training equipment, practical sessions, internship and job placements.